Whenever you buy new furniture, carpets or rugs or you have just had them cleaned and they look great, you might want to consider putting fabric protection on them. Especially if there is a high probability of spills occurring. For example, if you have young children or teenagers, have grandchildren who visit regularly, have pets (especially new pets or very old pets) or you like to entertain, consider protecting your upholstery, rugs and carpets. The reason fabric protectors are beneficial is that for spills, the liquid will bead up on the material allowing you time to address the spill before it soaks into the material. This repellent characteristic also keeps dirt from sticking to the fibers which improves vacuuming. The end result is that it helps the upholstery, carpets or rugs last longer. Plus, if you are not able to get to the spill in time to remove it, removal is made easier for a professional to clean. 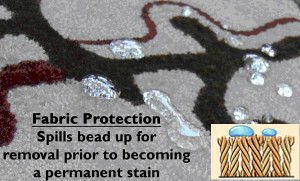 Fabric protectors have progressed to a point where they can protect against both oil and water based stains. But be careful, there are many different fabric protectors out there and some work very well and some do not work at all. Also, make sure you hire a company that knows what they are doing to apply the fabric protection. For example, applying scotchgard protection to a sisal rug is not advisable. Sisal rugs do not like water and Scotchgard uses water as the application medium. The result could be a discolored sisal rug. This is not to scare you away from using fabric protectors but to advise you to use a reputable company to protect your belongings. Ever noticed a dark line along the walls on your carpets?